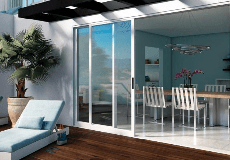 Windows and patio doors for the energy-conscious homeowner that are tested and built for your climate. At Milgard, we help consumers like you make an impact on their energy consumption by offering energy-efficient windows and patio doors designed for your homes comfort. We make it easy to meet local energy codes and green building efficiency standards with a selection of energy packages you can tailor to specific climate. We conduct thermal simulations to improve energy performance in our windows and patio doors and we adhere to ENERGY STAR® v6 requirements that meet or exceed U-Factor and Solar Heat Gain Coefficient (SHGC) criteria for the areas in which we serve. Learn the components of windows and patio doors that can effect energy efficiency levels in your home. Milgard is proud to be an ENERGY STAR partner and offer products that meet or exceed their requirements in the areas we serve. Homes with Low-E glass windows and patio doors enjoy more consistent temperatures year-round for comfort and energy savings. We make it easy to meet local energy codes with a selection of performance enhancing features.